High up in the hills, and away from the beaches, coastal resort towns, and all of the other things that you associate with the Algarve, is the little town of Monchique. Monchique is a popular destination with walkers, and there are several great hikes through the nearby forests. It main claim to fame, however, is the nearby spa town of Caldas de Monchique. Once even popular with Portuguese royalty, this now modern spa offers a wide range of treatments including water massages, jet-showers, and a steam room. Monchique’s own claim to fame surrounds Aguardente de medronhos, or just Medronho, a liqueur that’s made from the medronho berries that grow up here in the hills. 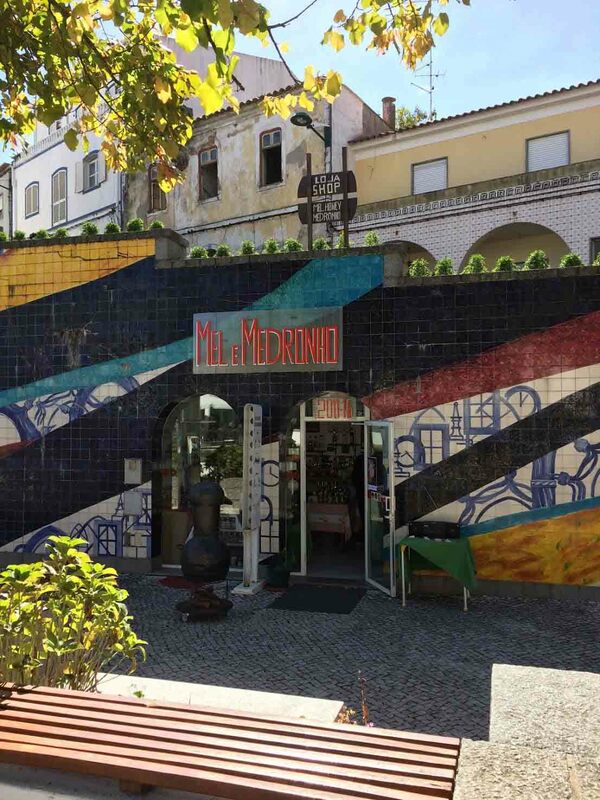 Medronho is a popular drink on the Algarve, and you will often be offered a glass after dinner. Strengths vary: the supermarket variety is around 40%, much the same as whisky or vodka, but the home-brewed variety can be a lot more potent. Locally, Medronho is believed to be good for colds and all kinds of illnesses. If you don’t fancy self-medicating with Medronho, you could also try some of Monchique’s honey. You’ll find many of the shops selling Medronho also sell honey. Although Monchique relies more on tourism today, in the past it produced clothing, fabrics, and the Monchique chair. These chairs are still produced today and, if you wander around Monchique, you’ll see workshops and small shops selling them. Monchique’s biggest attraction is probably, Foia, however. At 902 metres, this is the highest point on the Algarve. From here, you have some incredible views over the whole of the Algarve: as far as the West Coast on a good day. Although Monchique is situated up in the hills, it only takes around 30-35 minutes to get to the nearest beaches and towns like Portimão, Alvor, Ferragudo, Carvoreiro, and Lagoa. Hiring a car is recommended: although it is possible to travel to and from Monchique by public transport, or to get an airport transfer, having a car will give you a lot more freedom to explore. Monchique is on the Western Algarve, although not as far as the West Coast. It is located inland from the coast, roughly 35 minutes by car. Faro Airport, the Algarve’s airport, is 60 minutes by car if you take the A22 toll-road or 70 minutes if you take the normal roads. Although it’s located inland, it doesn’t take long to reach the coast and other parts of the Algarve by car: Praia da Rocha, Praia do Vau, and Praia dos Três Irmãos are all within a 30 minute drive. The beaches, small towns, and natural park on the West Coast are all less than 45 minutes away. The main hotel in the area, Macdonald Monchique Resort & Spa, is situated nearer to Caldas de Monchique and it’s here where you’ll get the spa treatments the area is famous for. Monchique itself also has a number of guest houses and B&Bs that offer great accommodation. Macdonald Monchique Resort & Spa – A large hotel with two beautiful swimming pools and, of course, the well-known spa. There are also two onsite restaurants and a 24-hour fitness centre. Vinha do Gaio – A small rural 6-bedroom guesthouse offering rooms with views over the mountains and coastline. Quinta das Relvinhas – Rustic accommodation with a swimming pool and sun terrace. Vilafoia – A modern guesthouse-style small hotel built from eco-friendly materials. This hotel has a beautiful garden and salt-treated swimming pool. Casa Spa d’Alma – A charming B&B that’s situated in the mountains of Monchique. Facilities include a swimming pool, hot tub, terrace, and hammocks. Foia – Foia is the highest point on the Algarve, and from here you can get fantastic views over the surrounding countryside. Walking – There are plenty of great walks through the forests of Monchique. Feira dos Enchidos – A small festival that takes place in March and celebrates the sausages and cured meats produced in Monchique. Feira do Presunto – Another meat-related festival, the Feira do Presunto is focused on cured ham, and takes place in July. For more events, check out the month-by-month guide to what’s happening on the Algarve.